For my birthday I like to keep things simple. All I really want to have on my special day is good food, good company, excellent music playing in the background, perhaps a sip of wine (or two) and, of course, a delicious cake to finish our repast. This year I had a small birthday luncheon here at home which, to my mind, was beautiful and pleasing to the eye & palate, because of its simplicity. Typical to the way I like to set a table for informal occasions, the china, linens and glassware where chosen and arranged with that effortless sense of calm that always puts guests at ease. The menu was fresh, tasty and infinitely edible. 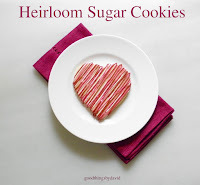 This is what I love: easy entertaining. In terms of how I choose a menu, I always like to start with the vegetables. I think of those I’d like to have that are in season and absolutely the freshest, then build around them. As far as the main course is concerned, it too needs to be of the season and it must absolutely complement the flavors & colors of my vegetables. You see, I always think in terms of what my dinner plate is going to look like with the main course. To me, a plate is like a blank canvas which needs to have visual, as well as gustatory interest. The more color I see on my plate, the happier I will be for it. From the few posts I’ve done on in the past, you will understand that an understated and quiet elegance is what I like best for table settings. I don’t really go for showy flower arrangements, gaudy silver & crystal or china which will detract from the food, because all people really want is to engage in good conversation and enjoy their meal. For the luncheon I started with my color theme. 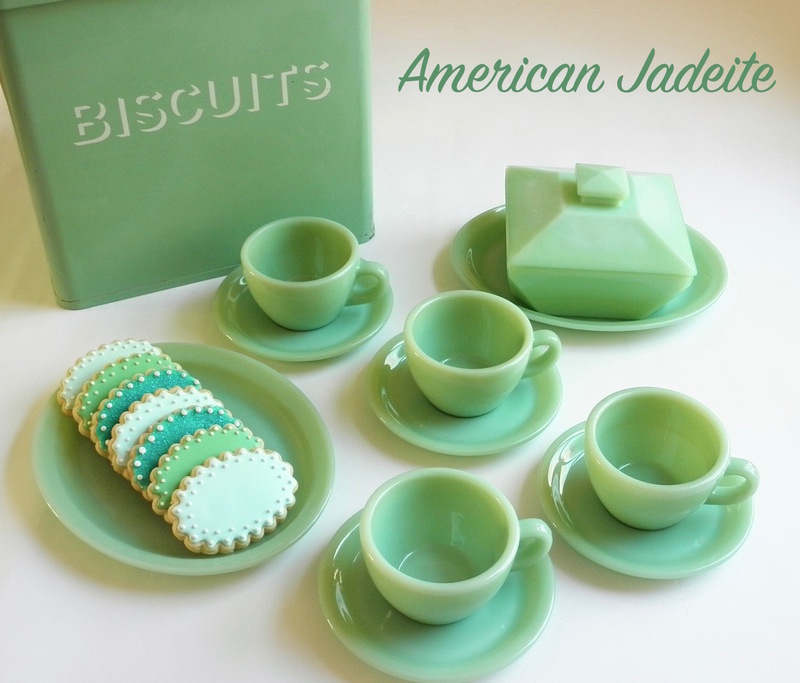 I chose pale creams & pastel blues, along with the soft green of jadeite. 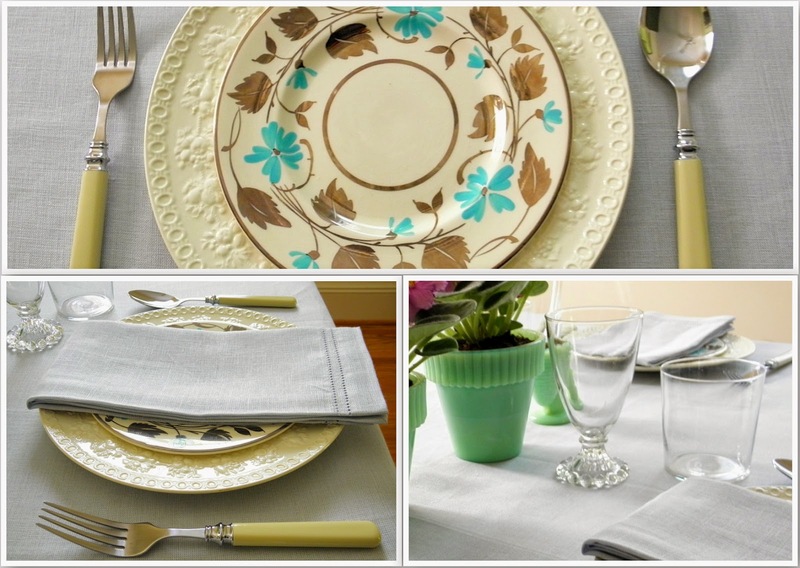 The tablecloth was a hemstitched pastel blue linen, the dinner plates were old Wedgwood creamware and the salad plates were vintage British lusterware that have hand-painted flowers; they complement the linens quite nicely. The glassware was an unpretentious Polish tumbler for water and a hobnail-footed goblet from the 1950s for the white wine. Meant to mimic old French ivory, the stainless steel flatware was also very casual. 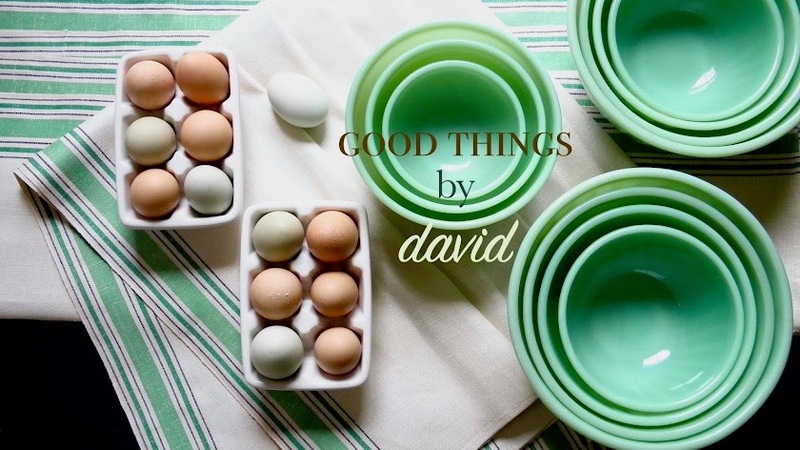 Last, but not least, were the small jadeite pots filled with African violets, flanked by jadeite bunny egg cups acting as master salt & pepper cellars. Here are a few photographs of my birthday luncheon. African violets in mauve are so beautiful and just the right size for the Fenton jadeite flower pots from my collection. 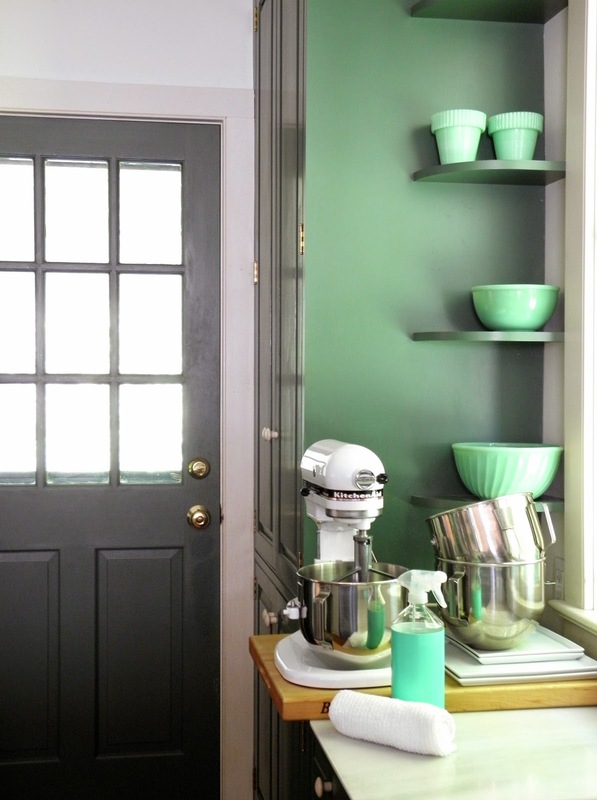 Although I didn't decorate anything with mauve, the small accent of color hit just the right note. A small bunny holds freshly ground pepper. Its counterpart on the opposite end of the table holds kosher salt. The diminutive bunnies were a recent birthday gift. From the moment I saw them, I knew they would be perfect for master salt & pepper cellars. Note the small glass shovels next to each bunny. For the salad course, I made a fresh tomato & corn salad. The orange cherry tomatoes and sweet white corn were from an Amish farm stand near my home, and the fresh herbs were from the garden. The plates are lusterware from the 1950s. I just love that gorgeous blue hue of the hand-painted flowers. For the main course I knew I wanted fresh crab cakes. I had been craving them for some time, so I went to the local Whole Foods and picked up a pound of Maryland blue crab for these tasty morsels. The haricots vert were blanched and sautéed with olive oil and minced garlic. The plates are old Wedgwood embossed creamware. When all was said and done, not a fleck of food was left on the plates. This is what I like to see. As for the cake, I made an old-fashioned, southern Jam Cake for my birthday cake. Yes, I baked my own cake! Again, I had been craving boysenberry jam for a while, so this was the perfect opportunity to use some and devour every sweet bite. Here is a piece of that tasty cake sitting on a hobnail clear-glass dessert plate. I can guarantee you that it was delicious. Don't worry, I will share that recipe with you in the near future. Our cat, Lion, being silly in front of company! Even if you only entertain just once this summer, I hope that this gives you an idea or two for your celebration or event. It's always nice to find like-minded individuals who can inspire me to create and share for my loved ones, and believe me, I have very creative friends who are on my radar for ideas. To me, it's all about sharing. Nature never ceases to amaze me. With so much wildlife around our home, it's not uncommon to see various animals walking by our windows during the day. Some of them have even become 'residents'. It just so happens that we were given one of those special and rare occurrences that can only be believed if seen firsthand. Thankfully my camera is always at the ready! A small miracle behind our house between a groundhog, a fox and a deer turned into something out of Peaceable Kingdom the other day. It's almost as if these three characters decided to put on a show for us and behave quite civilly toward one another. Yes, I was chuckling in between photographs, but really, it was rather jaw dropping to observe how mindful these creatures were of each other. You can see our resident groundhog, Henry, to the far left nibbling on some thick grass. The fox who isn't fully grown yet, is right in the center and looks as if it's going to attack. It didn't. The deer is on the right. 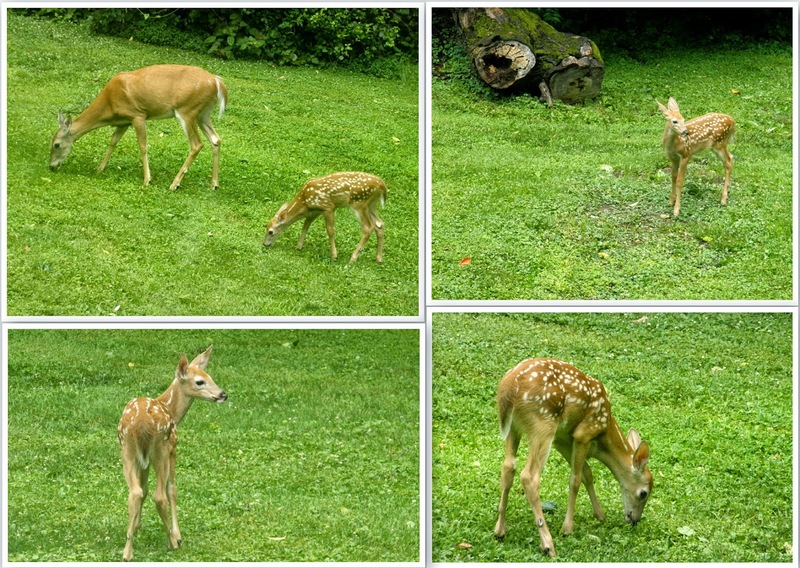 A mother and her fawn have been spotted around our residence these past few weeks. The baby stays very close to its mother, but once in awhile it does run around wildly, bucking & jumping every which way. The little one has such an adorable face. A den of foxes has taken up residence here just beyond the hill. 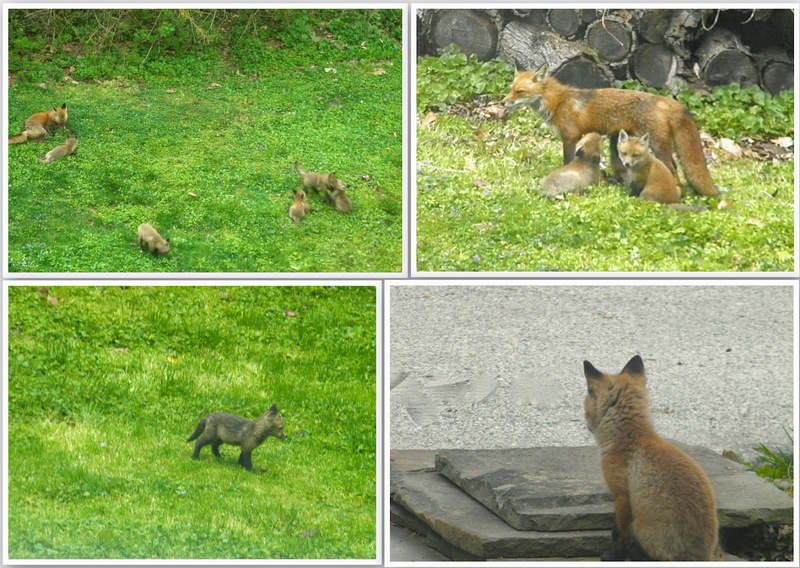 During the spring a couple of foxes gave birth to several kits; we counted 7-8 kits in total. It was so beautiful to see the babies playing with one another, nursing and even waiting for their mother to come back from a hunt. At the beginning, the kits were a very dark brown color, but as time went on, their coats became that familiar reddish hue. On several occasions we spotted one particular kit (bottom right) sitting on the slate steps waiting for its mother to come back from her hunts. 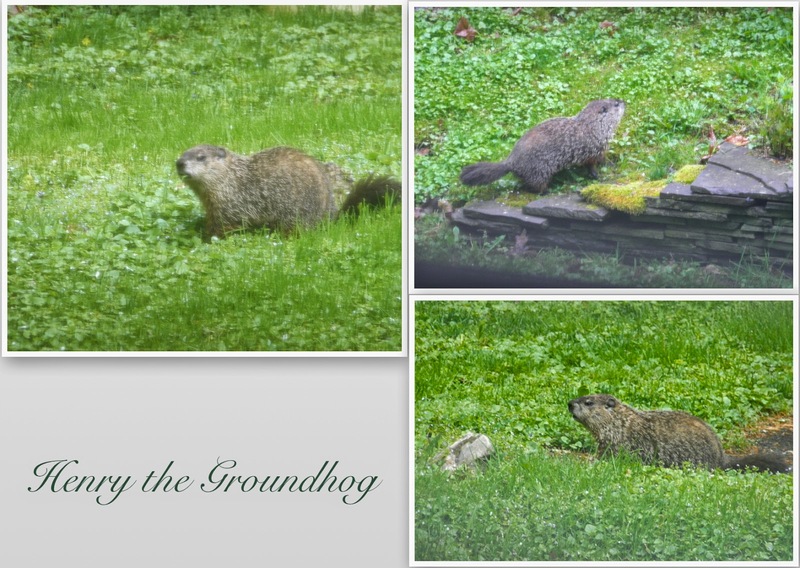 Our beloved groundhog, Henry, has survived several years of harsh weather and predators. I realize that many individuals view these creatures as nuisances, but since there is so much space here, Henry does as he pleases. He always brings a smile to our faces. The silly trio behaved as if it were just another regular day for them. I've only ever seen two of these animals near each other, never all three at once. The adorable fox was so well behaved! For a few moments we thought the fox was going to try and attack Henry, but he didn't. The fox decided it was best to just lie there and take a rest. Here they are mugging for the camera. As if on cue, they both turned to look at me. How cute are they? So it's not quite Peaceable Kingdom since there wasn't a lion nearby, but it's still remarkable to me. I don't think I will ever witness this scene again, since Henry pretty much keeps to himself. Perhaps Henry is mellowing out in his old age. Who knows? It was by pure chance that all three animals came together to pose for the camera and I'm only glad I was able to keep a steady hand while taking these pictures.